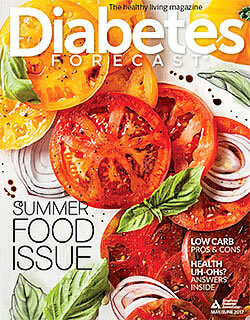 A free digital edition of every issue is included in your Diabetes Forecast subscription. Great recipes, inspiring stories, the latest news and expert advice. Thanks to all the companies who are working with us and giving back to help Stop Diabetes®. Your purchase will benefit the American Diabetes Association and fund diabetes research, outreach programs in local communities, and educational materials. We acknowledge our corporate supporters for joining us to raise awareness and change the future of diabetes! Find out more about our current promotions. ShopDiabetes.org carries the official merchandise of the Stop Diabetes® movement, where every purchase supports diabetes research, advocacy, awareness and education programs. At shopdiabetes.org you will find nutrition and meal planning tools, self-care and cookbooks, apparel, gifts, and resources for diabetes professionals.